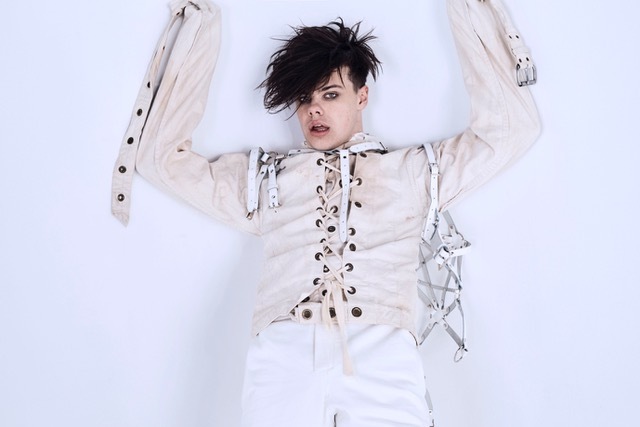 YUNGBLUD is a musician of the now - a punk idol that fits in with generation, an angsty young adult with tons of attitude. A sound that brings in punk influences of Slaves and Jamie T with more urban inspirations tapping Kendrick Lamar and alternative bands like Twenty One Pilots. Songs of political trash talking, parents splitting up and just generally going insane, its all ingredients for relatable music for an unsure young generation who refuse to start growing up. The Garage welcomes Dom as part of his small UK tour with Glasgow, Leeds and Birmingham that follows a heap of festivals Reading + Leeds, Rock Am Ring and Lollapalooza. Fans turning up to the venue’s doors from early afternoon, black heart tattoos on faces and wrists, it's clear a huge army of fans are arriving at the venue's doors..
Dom’s energy is contagious and the crowd only match this with an assertive rowdiness. One minute he is rapping, the next he takes out a guitar, he proves his versatility and the crowd echo his energy and lyrics in detail - it's a clear bonding relationship. As the energy-filled evening moves around tracks from his album '21st Century Liability'. The set drifts to a singalong inducing encore of’’ Machine Gun’ and ‘Die for the Hype’. And a very daring mashup Ariana Grande’s ‘God is a Woman’ and Juice WRLD’s ‘Lucid Dreams’ played to Nirvana’s ‘Heart Shaped Box’ riff proves to be a winner. All in all Miley Cyrus-esque tongue movements, middle fingers and stage carnage fuelled for an excellent Thursday evening. All eyes on the Yorkshire talent.